The church of Lady of the Sign is located not far from the Trubezh river near the western opening in the town’s rampart. 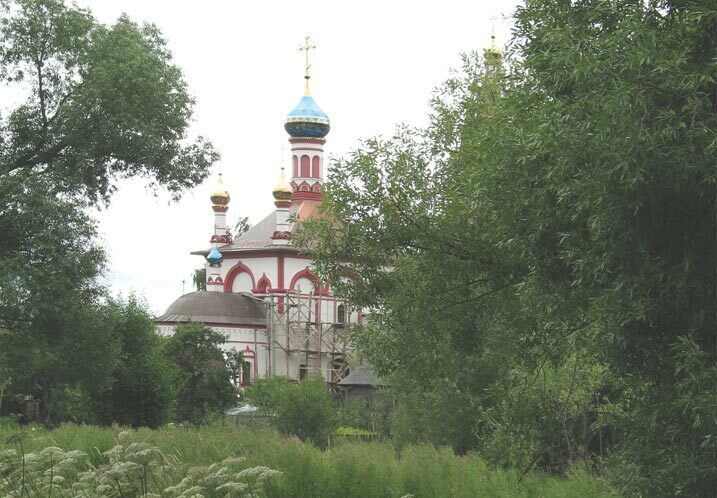 This is one of the recently-built cathedrals in Pereslavl-Zalessky, erected next to a wooden church, the money for which was given by Evdokia, the spouse of Dmitry Donskoy. The wooden edifice had a sad fate. It burnt down in the 17th century. Close to it was a church known already in the years of Peter the Great as the Church of Our Lady of the Sign “which stood near the ships.” The ships of the Peter the Great 's Funny Fleet were moored nearby; later, they were destroyed by fire. In 1788 Maslova Anna Ivanovna, the widow of a major, contributed money for construction of a new stone church which was supposed to be built instead of the previous wooden one. In 1863 the church established a parochial school attended by 20 to 30 children. In the 1930s the church was demolished and its foundation was used for the construction of a wine shop. At the initiative of the shop’s last owner, one A.G. Gromyko, it was torn down and Archbishop Mikhey gave his blessing for the construction of a new church. The construction went on for a number of years using donations from many people. Currently, work is being done on the interior decor of the church.